We're kicking off the new year with a bang as the first 2019 release of the Doctor Who Main Range is out now. The Fifth Doctor, Tegan and Turlough are joined by Kamelion, voiced by legendary impressionist Jon Culshaw, in Devil in the Mist. Writer Cavan Scott tells us more about this new trilogy, "Writing for Kamelion was too good an opportunity to miss. I’m a sucker for robots and the great thing about Kamelion is that he’s such a blank canvas. We never really got to know him on TV, mainly because the prop didn’t work. So it meant that we could take everyone’s favourite shape-shifting robot in whatever direction we wanted, unfettered with what’s gone before. It was remarkably freeing! "And of course he also upsets an already fractious TARDIS team. Part of my brief was to deal with Tegan’s obvious prejudice against him, which actually provided the spark for my story." Devil in the Mist is available now at £14.99 on CD or £12.99 on download. All CD purchases unlock a download option via the Big Finish app and the Big Finish website. Kamelion features again in the February Main Range release, with two stories written by Jamie Anderson and Eddie Robson. 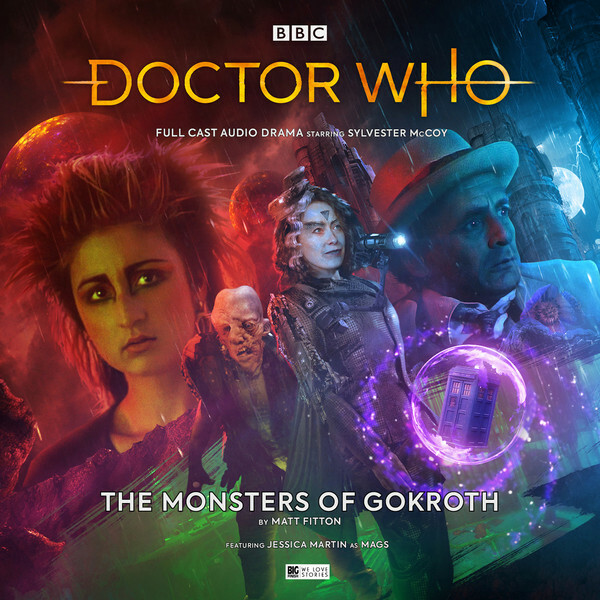 Plus, revealed today is the artwork for the first in a trilogy of adventures with the Seventh Doctor and Mags, starting in April 2019, The Monsters of Gokroth. Three new Main Range adventures will reunite the Seventh Doctor and his friend, Mags, the punk werewolf circus performer first seen in 1988’s Doctor Who story The Greatest Show in the Galaxy. Alongside Sylvester McCoy, Jessica Martin reprises her role of Mags in this trilogy of terrifying tales… the first arriving in April.